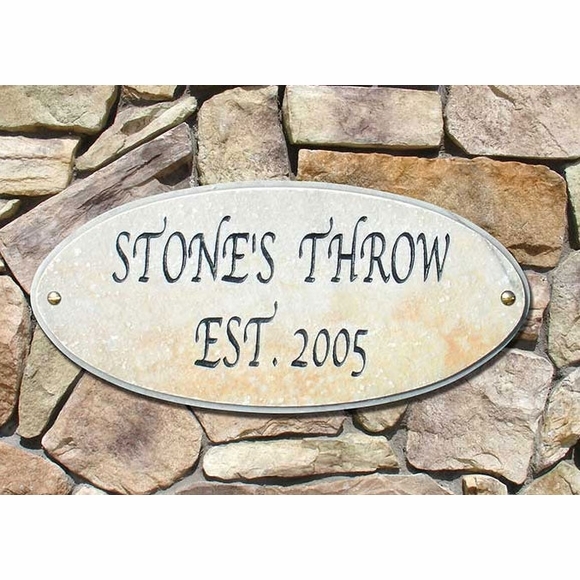 Personalized 2 Line Granite Address Plaque - - Oval plaque features a fancy italic-style font which makes it stand out from the more typical font used on plaques. Makes a great address plaque with house number, street name, or family name. Also for use as an established plaque, circa plaque, built plaque, cabin sign, location marker, or your own custom message. This sign was a gift to my brother and sister-in-law to place on the 216 year-old house they recently purchased in Stockbridge MA. They were surprised and delighted!